This pipe volume calculator estimates the volume of a pipe as well as the mass of a liquid which flows through it. This calculator is a helpful tool for everyone who needs to know the exact volume of water in a pipe. It will be helpful to you if you're, for example, designing an irrigation system for your garden. Keep on reading to learn what is a cylinder, find the volume of a pipe formula and check the "user's manual" for correct calculations in the pipe volume calculator. Knowing the volume of pipe might be useful for many reasons. It will be beneficial for private home owners as well as civil engineers and construction workers. For example, you may want to know the water capacity of your in-home heating system, or wonder if the pipe diameter you have chosen will be sufficient for refilling the garden pond. 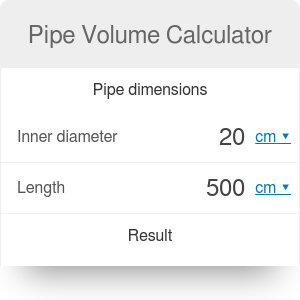 This is the reason why we created the pipe volume calculator. This tool provides you with the volume of a specific pipe, and the weight of the water (or other liquid) inside it. It is simple in use and effective. All you need to do is to enter the pipe size - its inner diameter and the length. It doesn't matter whether you use the metric or imperial system of units because you can freely switch between them using the drop-down list. By default, the calculation of liquid weight is done for water (its density equals 997 kg/m³). If you need to do the calculations for other fluid, click the advanced mode button and type in the density of your specific liquid. Below, we prepared an explanation of the volume of a pipe formula and a step-by-step example of calculations to show you how to use the pipe volume calculator properly. By shape, a pipe is a hollow cylinder. But what is a cylinder? We can see them every day around us. It is a solid with two bases which are usually circular, and always congruent and parallel to each other. The 'unrolled' side of a cylinder creates a rectangle. The height of a cylinder is the distance between the bases (in case of a pipe, it is its length). The radius of the cylinder is the radius of its base. Keep in mind that when you have a cylinder, the diameter is a doubled radius. So, for calculations, you need to halve the diameter. Circular hollow cylinder, where R - radius, r - inner radius, h - height. The volume of a 3-dimensional solid is the amount of space it occupies. For a pipe, it is the inner volume (you need to take the inner diameter instead of the outer one). To express the volume, we use cubic units (for metric cm³, dm³, m³, and for imperial in³ and ft³). To get proper results, use one unit consistently throughout the whole computation. The formula for the volume of cylinder is: cylinder volume = π * radius² * height. For a pipe use its length instead of height: pipe volume = π * radius² * length, where radius = inner diameter/2. The volume of a pipe is equal to the volume of a liquid inside (if a pipe is fully filled with it). The mass of the liquid is taken from the transformed density formula. So, respectively: liquid mass = volume * liquid density. Let's see how to use the pipe volume calculator correctly. For an example calculation, we need a few assumptions. We will calculate the volume of a 6-meter length pipe, with an inner diameter equal to 15 centimeters. The pipe is used to transport water. Let's put these data into the calculator to find the volume of water in the pipe, as well as its mass. First, enter the pipe's diameter: inner diameter = 15 cm. Then, type in its length: length = 6 m.
Click the advanced mode button and check the liquid density. The default value is set for water, so it is correct in our case. Liquid density = 997 kg/m³. Now, the calculation results are available for you: volume = 0.106 m³ and the liquid mass = 105.71 kg. Pipe Volume Calculator can be embedded on your website to enrich the content you wrote and make it easier for your visitors to understand your message.